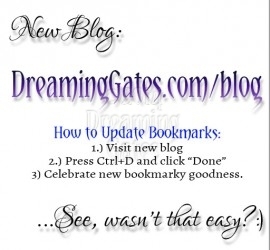 This entry was posted in Website News and tagged dreaming gates relocation website on 1 January 2014 by dreaminggates. Yep, we are relocating the Dreaming Gates blog. Not a big change, just shifting directories around as part of our website relaunch project. Don’t worry–the new location is easy to remember. The blog is now located here: http://dreaminggates.com/blog. Please update your bookmarks. Thank you!